Balancing a job and graduate school isn’t easy. You have to make a lot of sacrifices when it comes to how you spend your time. Hanging out with friends will be replaced with studying, and staying late at work or working on weekends will be replaced with heading to class. It’s a difficult path through the results should be well worth the effort if you choose a quality part-time MBA program. For those living in the Midwest, choosing the right part-time MBA program is not easy. Many of the highest ranked part-time MBA programs (according to the U.S. News & World Report) call the Midwest home. So, what’s the best program for you and why? We’re taking a look at the top five part-time MBA programs in the Midwest and telling you how they rank and why you should consider them. The University of Chicago Booth School of Business is home to the top ranked part-time MBA program in the country, and it’s number one on our list of Midwest schools. The school offers two options: an Evening MBA and a Weekend MBA. The curriculum is the same for both options and consists of 20 classes plus Leadership Effectiveness and Development (LEAD), an experiential leadership development program. The part-time format at Chicago Booth is flexible with the majority of students graduating in 2.5 to three years, and some taking up to five years to finish. Students come from all walks of life representing more than 35 industries and 370 companies. About 70 percent of the Weekend MBA students live outside of Illinois and travel to Chicago each weekend for class. Ranked third in the nation and second on our list, Northwestern University’s Kellogg School of Management is also in Chicago, Illinois. Like its fellow Windy City business school, Kellogg offers two part-time MBA program options, including an Evening MBA and Weekend MBA. Both options are designed for students looking to propel their professional development while not putting their career on hold. The Evening MBA is ideal for Chicago residents while the Weekend MBA is ideal for students who travel or live outside the city. In either case, the Kellogg part-time MBA program allows students to set their own pace, graduating in one to five years. The program is fully customizable with more than 100 electives available and three to seven majors including Finance, Marketing, and Strategy. 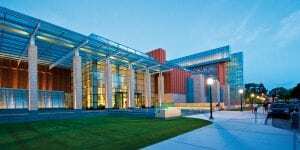 The University of Michigan Stephen M. Ross School of Business is ranked sixth in the nation and third on our list of part-time MBA programs in the Midwest. Both the Evening MBA and the Weekend MBA offer a similar experience with hands-on curriculum, including the Multidisciplinary Action Projects (MAP) course, a full term working on real-world challenges. The Ross part-time MBA option is balanced so students can participate in campus life while fitting classes into a busy schedule. One of the unique aspects of the Ross part-time MBA program is the ability to take online courses whenever works best for you. The curriculum includes a total of 60 credits with 30 percent being distance learning. Also, students have many co-curricular opportunities to enrich their experience through workshops, live case competitions, and more. Ranked seventh in the nation and fourth on our list of part-time MBA programs in the Midwest is the University of Minnesota Carlson School of Management. This part-time MBA program is highly tailored to a student’s needs. You have the flexibility to choose how you want to structure your coursework, composed of 52 credits. Classes are held on-campus on weeknights, on compressed weekends, and online. There are even global experience opportunities. With over 100 electives and six specializations to choose from, the Carlson part-time MBA is fully customizable. You’ll tackle real-world business challenges in the classroom through experiential learning and expand your international experience with intensive study abroad programs. And even if you’re unable to travel, there are four courses designed to explore international business in-depth. In addition, it is also among the most affordable highly-ranked part-time programs in the country. Indiana University’s Kelley School of Business is home to the final part-time MBA program to make our list, ranking ninth in the nation. The Kelley School offers only a flexible Evening MBA program that’s 24 months long and designed for students working full time. The curriculum consists of 33 credit hours of core courses, six credits of executive skills, and 15 credits of electives. You can also major in one of four concentrations: management and entrepreneurship, finance, marketing, and supply chain management. There’s also an opportunity for an international consulting course for ten days over spring break, as well as many student life options. There are Evening MBA student organizations, evening events, mentoring opportunities, and more.